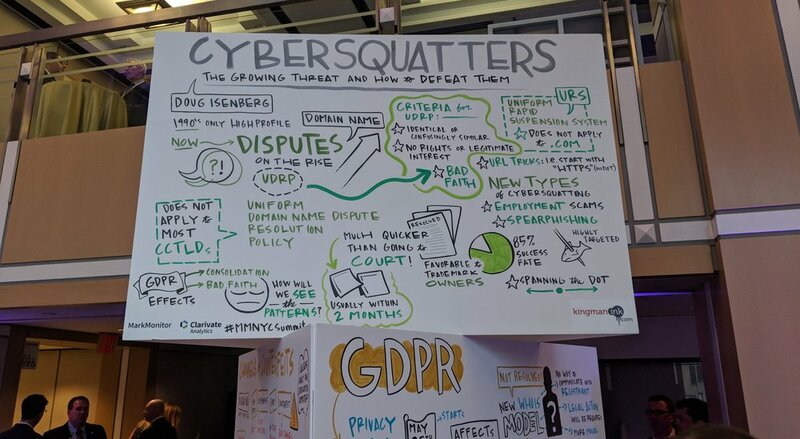 Doug Isenberg gave a presentation on "The Growing Threats from Cybersquatters -- and How to Defeat Them" at MarkMonitor's New York Summit on April 24, 2018. Doug's presentation addressed a variety of domain name issues important to trademark owners, including a record number of domain name dispute filings under the Uniform Domain Name Dispute Resolution Policy (UDRP); the impact of new gTLDs; clever tricks employed by cybersquatters; the impact of the General Data Protection Regulation (GDPR); and more. "Domain name disputes are on the rise, cybersquqatters are getting smarter, the expansion of the domain name system is creating new headaches, and the EU’s forthcoming General Data Protection Regulation -- the GDPR -- is only going to create new opportunities for cybersquatters," Doug told attendees. Doug's presentation was captured live by a visual note-taker on an oversized foam board (see image above). Other speakers at the Summit included representatives from Facebook, Verizon, Johnson & Johnson, Verisign, WeWork, and more. Doug is a domain name attorney who has represented trademark owners in domain name disputes for more than two decades.